Five Spice is a blend of these fragrant spices--cinnamon, star anise, corriander, cumin, and sichuan pepper. 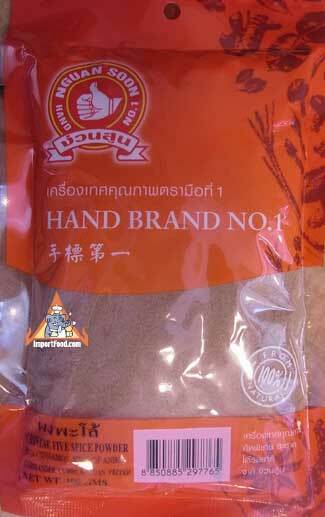 Our Five Spice is made in Thailand by Hand Brand, using the very best spices, a generious 3.5 oz in a modern sealed packageMany recipes call for "Five Spice", and we are proud to offer this from Hand brand. Ingredients: cinnamon, anise , coriander seed, cumin, sichuan pepper. Pork Leg on Rice, '"Khao Kha Moo"